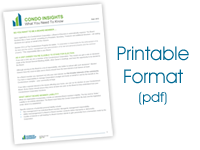 Two different insurance coverages that are available for condo unit owner insurance policies. ALE coverage responds when there has been damage to your Unit, with the damage being an insured peril covered under your Unit Owner Policy (not the Corporation’s policy). If there is fire or water (excluding seepage) damage to your Unit, the peril of fire or water is a covered peril by the Corporation’s Insurance, so if you had to relocate for a time your ALE coverage would respond. The intent of the coverage is to pay for “reasonable” expenses over and above your normal monthly costs so you can maintain a normal standard of living. Typically the ALE coverage limit is determined by a percentage of your contents limit. If your contents limit is $25,000, and the insurer’s calculation is 50% of the contents limit, you would have a $12,500 ALE limit. The percentage varies for each insurer, so it is imperative to review limits with your insurance broker to know your limit and ensure adequacy. With some very large fires in Calgary Condominiums in the past years, Owners may not have been able to reoccupy their units for 12 – 24 months. Claims can keep Owner’s out of Units three to 12 months, depending on the severity of damage. If you are out of your Unit for 14 months, and you rent at $1,200 a month, then $1,200 x 14 = $16,800. With an ALE limit of $12,500 the difference would be paid out of your pocket, and this is not including other additional expenses you may have accumulated. What is your ALE limit? Is there a limitation on the amount your policy will pay per day, per month, per year? Can you increase this limit and how much will that cost? Does your ALE coverage have a time restriction to get back into your Unit, such as 12 months? The assessment is valid under the Condominium Corporation’s governing rules. The special assessment is made necessary by a direct loss to common elements. The Corporation’s insurance proceeds are inadequate to cover the costs. Damages fall below the Corporation’s deductible.